Despite being peppered with 45 shots against, the North Bay Battalion took home-ice advantage from the Niagara IceDogs as a three-point night from centre Mason Primeau powered the Troops to a 5-2 victory and evened the series through two games. After notching a power-play marker in the opening frame, left-wing David Levin then nabbed the overtime winner to lift the Sudbury Wolves to a 3-2 win over the Mississauga Steelheads for a 2-0 series lead. The Saginaw Spirit found the win column in back-to-back nights thanks to a three-point outing from trade deadline acquisition Owen Tippett, who guided his side to a 2-0 series advantage versus the Sarnia Sting following a 5-1 win. 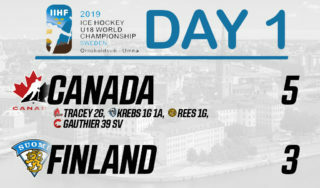 A four-goal outburst in the opening frame, including the eventual game winner by captain Barrett Hayton, was enough for the Sault Ste. Marie Greyhounds to take down the Owen Sound Attack in an eventual 6-3 final that knotted the quarter-final series at one a piece. 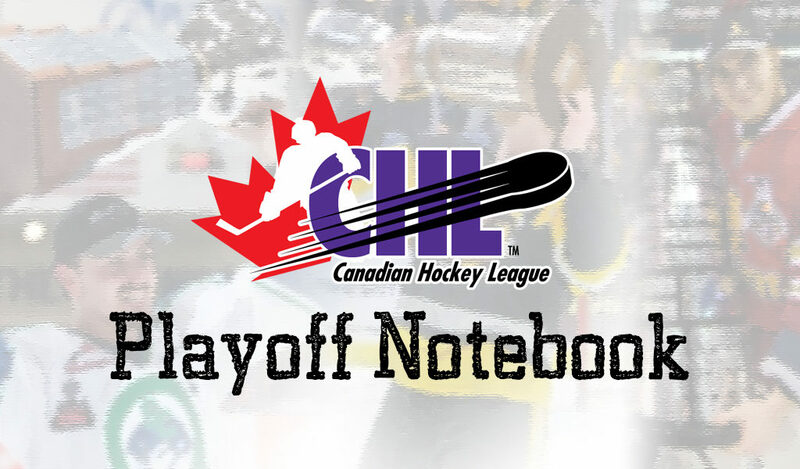 Separated by 86 points in the regular season, the Shawinigan Cataractes shocked the top-seeded Rouyn-Noranda Huskies in Game 2 by coming away with a 4-3 win in which goaltender Justin Blanchette turned aside 57 shots. It wasn’t the result he was hoping for, but an 80-save performance across four overtimes earned netminder Alexis Shank first-star honours in the Chicoutimi Sagueneens’ 3-2 loss to the Rimouski Oceanic that pushed the opposition’s series lead to two. For the second night in a row, the Quebec Remparts stunned the Halifax Mooseheads on home ice as forward Philipp Kurashev offered up the overtime heroics to cap a 5-4 victory and 2-0 series lead. A four-point outing, including one goal and three assists, by centre Mika Cyr led the Moncton Wildcats to a 5-2 decision versus the Baie-Comeau Drakkar for an even series through two games. 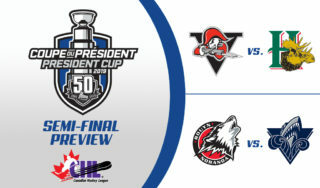 It was all Sherbrooke Phoenix in Game 2 against the Blainville-Boisbriand Armada as 2019 NHL Draft hopeful Samuel Poulin pocketed a hat-trick en route to a 6-0 blowout and a 1-1 series. After leading the Charlottetown Islanders in regular season scoring, Daniel Hardie has maintained his offensive touch through the postseason, picking up two goals and one assist in Game 2 against the Cape Breton Screaming Eagles to push his squad to a 2-0 series edge. Captain Canada delivered for the Drummondville Voltigeurs as a hat-trick by left-wing Maxime Comtois guided the club to a 4-1 outcome and a 2-0 series edge against the Gatineau Olympiques. 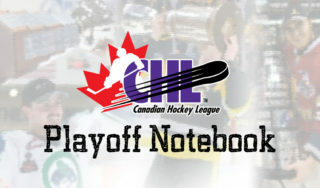 Jake Leschyshyn decorated the score sheet for the Lethbridge Hurricanes in Game 2 against the Calgary Hitmen as the left-wing wrapped up the night with a hat-trick en route to a 4-1 final and two-game margin. 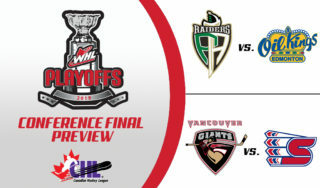 A three-goal night by Brandon Hagel of the Red Deer Rebels wasn’t enough as the Prince Albert Raiders pumped six goals of their own in an eventual 6-4 final to grab a 2-0 series lead. Danish netminder Mads Sogaard turned aside 49 shots to help the Medicine Hat Tigers to a 2-1 victory against the Edmonton Oil Kings in Saturday’s quarter-final opener. After a lopsided outcome in Game 1, the Seattle Thunderbirds rebounded Saturday against the rival Vancouver Giants as captain Nolan Volcan notched one goal and two assists in a 4-1 result. A pair of tallies by right-wing Max Gerlach guided the Saskatoon Blades to a 3-1 win in Game 2 versus the Moose Jaw Warriors as the home squad pushed its series advantage to two games. A four-goal flurry in the final frame, including the second of the game for centre Josh Paterson, powered the Portland Winterhawks to a 5-3 win over the Spokane Chiefs to even the opening-round match-up at one a side. Captain Jermaine Loewen picked up the game winner and his second point of the night as the Kamloops Blazers upset the Victoria Royals to even their series through two games. The Everett Silvertips gained a 2-0 series advantage on the Tri-City Americans thanks in part to another multi-point showing from defenceman Jake Christiansen en route to a 4-3 victory.